On the afternoon of Friday, February 28, 1890, a single pistol shot rang out in a corridor of the United States House of Representatives. Former eastern Kentucky congressman William Preston Taulbee (Figure 1) laid mortally wounded on the marble stairs leading up to the congressional Press Gallery. Standing over him holding a pistol was a Louisville Times correspondent, Charles E. Kincaid, who had just ended a simmering feud between the two prominent Kentuckians. Figure 1. William Preston Taulbee as a young man, from a tintype in possession of his great-grandniece (copy photograph by Joe Nickell). William Preston Taulbee was born in Morgan County on October 22, 1851, a son of state senator William Harrison Taulbee (1824–1905) and Mary Ann (Wilson) Taulbee (1832–1916).1 Called “Will Press,” he was educated in the county one-room schools and later (1871–1877) was himself a schoolteacher. In the meantime he married Lou Emma Oney (1852–1903) with whom he eventually had four sons (three of whom became colonels in the U.S. Army). Taulbee studied for the Methodist ministry from 1875 to 1878 and subsequently “itinerated” (i.e., was an itinerant preacher) for several years (“Taulbee, William Preston” 1893). He became clerk of the Magoffin County Court in 1878 and again in 1882. A year earlier, he was admitted to the Kentucky Bar. A Democrat, he was elected to the House of Representatives from what was then the Tenth District in 1884. He was re-elected in 1886 but declined to run for a third term, instead remaining in Washington engaged in real estate business (“Shooting” 1890). According to The New York Times, Taulbee, then thirty-nine, was “of tall figure, with a frame sinewy and strong, but lean.” The paper continued: “He soon became known in the House as a ready talker, and was more frequently on his feet than any other young member. He had a very powerful voice, and in the tumult which sometimes occurred in the House it could be heard above the din.” His ability as a speaker earned him the appellation, “The Mountain Orator” (“A Murder” 2015). Kincaid is a slightly built, inoffensive-looking man. . . . [H]is family is one of the best known in Kentucky. He has a wide acquaintance in social circles here, and has spent considerable time in attending receptions, parties, and other society events. He has been in ill health for about two years, suffering from nervous and other ailments, following an attack of typhoid fever. He went to England last Summer for the benefit of his health, and returned somewhat improved. Little was known about the strife between the two men except that, according to the Times, it “originated about a year and a half ago in the publication, by the correspondent, of a statement affecting the moral character of the Congressman” (“Shooting” 1890). Indeed, the frail Kincaid, described as not over five feet three inches (in contrast to Taulbee who was “considerably over 6 feet tall” [qtd. in Gilbride 1962]), “had written a story accusing Taulbee of misconduct with a woman in a government office”—what the Washington newspapers at the time had called “the patent office scandal” (Gilbride 1962). According to Taulbee’s brother Dr. J.B. Taulbee, the feud between the two men actually began when congressman Taulbee objected to Kincaid’s having received a political appointment that he then sublet to another for half the pay; Taulbee sought a congressional resolution prohibiting such unethical acts. When Taulbee later refused to endorse Kincaid for a position, Kincaid, according to Dr. Taulbee, threatened to make the congressman sorry. Kincaid responded that those charges were baseless and that he had no ulterior motive in writing that Taulbee had allegedly been having an affair (“A Murder” 2015). The two men had had an altercation earlier on the day of the shooting when the two met and Kincaid said something in an undertone. 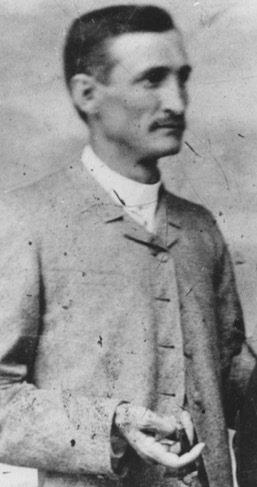 Taulbee, reported the Times, “who is large-framed and muscular,” was seen to “grab Kincaid by the lapel of the coat and with a strong grasp held him while he said: ‘Kincaid, come out into the corridor with me.’” To this, Kincaid responded, “I am in no condition for a physical contest with you. I am unarmed.” Taulbee replied that he was also unarmed, took Kincaid by the ear, and directed him to the door. The two were then “separated by some common friends.” At that, “Taulbee and Kincaid then went their way, the former into the House and the latter, it is supposed, after a pistol, for, as he stated, he had none at the time” (“Shooting” 1890; “A Murder” 2015). As the Times concluded, “The remainder of the testimony was merely corroborative” (“Kincaid Held” 1890). At first, doctors thought the shot was not fatal, but over the next few days at Providence Hospital his condition worsened; he died at 4:45 on the morning of Tuesday, March 11. An autopsy by Dr. D.S. Lamb revealed that the bullet had passed under the eye, in a downward trajectory. (More on this presently.) The projectile had fractured a part of the orbital plate (eye socket) and heading toward the brain, splintered an area (the petrous region) of the temporal bone (a bone on either side of the skull, at its base). The bullet was found imbedded in that bone and in dura mater (brain membrane). Dr. Lamb concluded that had the penetration been deeper, even perhaps a sixteenth of an inch farther, death would probably have been instantaneous (“Kincaid Held” 1890).In its report on the day following the shooting, The New York Times had offered: “Who was the aggressor at this last meeting, or what position either man occupied with reference to the other at the time the shot was fired it is impossible to state definitely” (“Shooting” 1890). Actually, though, Kincaid initiated the second, fatal encounter, and it seems likely that he had armed himself before that event. He approached Donaldson and Taulbee from behind. Congressman Carlisle saw Taulbee right after he had been shot and stated soon thereafter that Taulbee asked him who had shot him—“showing,” as the Times had concluded, “that he had not seen his assailant” (“Shooting” 1890). Now, the descending trajectory of the bullet indicates that the much shorter Kincaid was elevated with respect to Taulbee. Indeed that is borne out by Donaldson, who testified that he and Taulbee “had passed across the first landing” and proceeded to the left “when he stopped on the second or third step” and turned to Donaldson, at which moment Kincaid appeared “on the landing just behind us” (“Kincaid Held” 1890). Thus elevated, he aimed downward to shoot Taulbee in the face. The pistol was no more than “the length of a man’s arm” away (“Shooting” 1890). It is for a reason that I have reconstructed the elements of the scene: the shooter’s elevated position relative to the victim, the downward trajectory of the bullet, the statement of Samuel Donaldson that Kincaid had appeared on the landing behind and above them, that Taulbee had just turned to look back, and Congressman Carlisle’s statement that Taulbee had not known who had shot him. The reconstruction is necessary in order to counter Kincaid’s later claims as to what had happened. Although the inquest jury had found that Taulbee died from the shot of a pistol that was “held in the hand of Charles E. Kincaid in the United States Capitol Building on Feb. 28, 1890” (“Kincaid Held” 1890), Kincaid would claim he shot Taulbee in self-defense. In a statement, Kincaid claimed that Taulbee had been pursuing him aggressively for over a year. “I am almost ashamed to acknowledge it, but he has assaulted me six times.” On the morning of February 28, he said, he and Taulbee argued, and “Mr. Taulbee then gave me a violent push against the door and the doorkeepers separated us.” He made no mention of Taulbee claiming to have a gun or urging him to get one, as would eventually be alleged. “Later, about 1:30 p.m. I went to the House restaurant to get my lunch. Mr. Taulbee met me and advanced toward me in a threatening manner. I warned him off, but he drew back his arms as if to strike, when I fired and he fell” (“Settled” 1890). The trial was held about a year after Taulbee’s death. Although there was never any evidence that Taulbee was armed, Kincaid claimed he had been terrorized by Taulbee and had shot him in self-defense. Disputing that claim was his initial statement made as he was taken into police custody, claiming that he shot Taulbee as a matter of honor: “When he pulled my ear today and I knew the boys on the [press] row had seen it, I was crazed” (“A Murder” 2015; “Charles E. Kincaid” 1906). After my centennial article on Taulbee’s assassination appeared (Nickell 1990), I learned of a follow-up claim: Taulbee’s unrequited ghost haunts the steps that are still marked with his blood. On a later visit to Washington, I was directed to the site by a capitol guard. According to ghost raconteur John Alexander (1998, 69), capitol workers have claimed the supposed bloodstains are resistant to all cleaning agents. The motifs (or narrative elements)—“Revenant [ghost] as blood” and “Ineradicable bloodstain after bloody tragedy”—are common in legends and are well known to folklorists (being catalogued in a six-volume reference set [Thompson 1955, 2: 446]). I have encountered several such legends, which are invariably intended to suggest some supernatural agency. In one case amenable to forensic investigation, when a stain proved not to have been blood and its actual source identified, a particular claim was discredited (Nickell with Fischer 1988, 119–128). Now, in the case of the stains on the capitol gallery steps, Alexander (1998, 69) reports that some (unspecified) persons deny the splotches are actually from Taulbee’s spilled blood. On the other hand, it would be quite a coincidence for the original bloodstains to have been cleaned away while other stains subsequently appeared on the steps—stains forensically consistent with blood having first dripped and pooled then blackened with age (Cf. Genge 2002, 98–102; Kirk 1974, 194–95). Blood could have seeped into the marble, which is highly porous.2 Years of throngs shuffling over the stairs have not worn the stains away, and cleaning crews have long since resigned themselves to their presence (interview by Gilbride 1962). I strongly suspect that any claimed ghost appearances, at the “exact spot” of the bloodstains, are the result of the latter inspiring the former. The common motifs linking bloodstains to ghosts may well have inspired the tale of haunting—whether there were actual reports of sightings or not. It is likely there was also an impetus for such a story from the unsettling fact that Taulbee’s assailant got away with murder. Early suggestions for my 1990 centennial article came from Roger Buchanan of Hazel Green, KY, and Earl Kinner, Jr., ed. of The Licking Valley Courier, W. Liberty, KY. The tintype of William P. Taulbee was generously provided for copying by Ella Mae Phipps, then Postmaster of Cottle, KY. (Lou Taulbee was her great, great aunt.) Recent research assistance was provided by CFI Libraries Director Timothy Binga, including online materials and acquisition of books. Wikipedia (“William P. Taulbee” 2015) gives the birth year of Mary Ann Wilson Taulbee as 1831; however, I have used the date inscribed on her tombstone in the Taulbee Cemetery, Insko, Kentucky (Nickell et al. 1981, 108). Alexander, John. 1998. Ghosts: Washington Revisited: The Ghostlore of the Nation’s Capitol. Atglen, PA: Schiffer Publishing Co.
A Murder in the Capitol. 2015. Online at http://www.genealogy.com/ftm/p/u/r/sandi-I-Purol-MI/BOOK-0001/0024-0001.html. Accessed August 25, 2015. Charles E. Kincaid. 1906. The New York Times (November 3). Gilbride, Neil. 1962. The Arizona Republic (February 25). Grotz, George. 1976. The Antique Restorer’s Handbook. Garden City, NY: Doubleday.Hauck, Dennis William. 1996. Haunted Places: The National Directory. New York: Penguin Books. Kincaid held in jail. 1890. The New York Times (March 13). Kirk, Paul L. 1974. Crime Investigation, 2nd ed. New York: John Wiley.Krepp, Tim. 2012. Capitol Hill Haunts. Charleston, SC: Haunted America. Nickell, Joe. 1990. Historical sketches. Licking Valley Courier (February 22). Nickell, Joe, with John F. Fischer. 1988. Secrets of the Supernatural: Investigating the World’s Occult Mysteries. Buffalo, New York: Prometheus Books. Nickell, Joe, J. Wendell Nickell, and Ella T. Nickell, compilers. 1981. Morgan County, Ky., Cemetery Records. West Liberty, KY: privately printed. Settled a grudge. 1890. The Chicago Tribune (March 1). Shooting in the Capitol. 1890. The New York Times (March 1). Taulbee, William Preston. 1893. The National Cyclopædia of American Biography. Vol. 3. New York: James T. White & Co.
Thompson, Stith. 1955. Motif-Index of Folk Literature, rev. ed., in the 6 vols. Bloomington: Indiana University Press. William P. Taulbee. 2015. Online at https://en.wikipedia.org/wiki/William_P._Taulbee.